Diamond Hearts & Arrows Device. In the example below, red represents light being emitted from the diamond in a direction and intensity that will be perceived by the viewer as brightness. Pink areas represent areas of less brightness. Dark areas indicate areas where light is blocked by the viewers head (these areas are perceived as dark flashes, or scintillation, when the viewer or the diamond moves). Finally, white areas indicate where light is traveling through the diamond, and 'leaking' out of the bottom (perceived as dull or dark areas in the diamond). Different types of viewers will use different color schemes, but all produce similar patterns. Consumers are often misled regarding the quality of a hearts and arrows pattern. 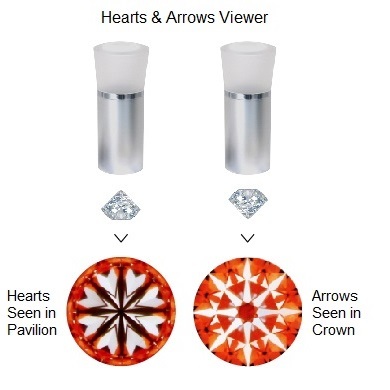 While a diamond may display what appears to be a pronounced hearts and arrows effect, several subtle details in the shape, spacing, and positioning of the pattern can have a significant impact on desirability and therefore value. 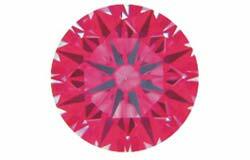 These variations are often not detectable by any except experienced graders or jewellers. A note of caution: GIA does not recognize hearts and arrows as a component of cut grade. This is partly due to the fact that the presence of the pattern is not a guarantee of cut. Occasionally you will see a hearts and arrows notation on a GIA certificate. This is simply GIA noting that an H&A inscription is present on the girdle of the diamond. 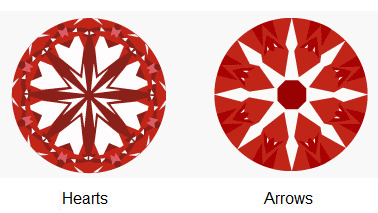 This is provided as information only, not as a confirmation of the presence or quality of any hearts and arrows pattern in the diamond itself. We believe the best approach to hearts and arrows is not to be carried away by the marketing of the pattern. One of the reasons GIA (and AGS) do not incorporate or acknowledge H&A in their grading is that it has never been shown to be preferred by consumers in blind tests. While the pattern has an emotional appeal, its actual affect on appearance is debated.